Victory seated above stadium holding palm branch. Left to right: Mercalfe, Owens and Osendarp. 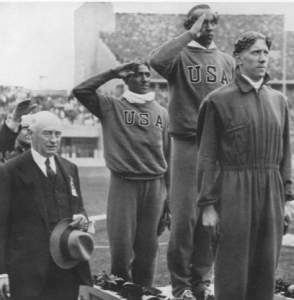 According to the Olympic Statutes, medals of victory are to be awarded in silver-gilt, silver and bronze to the victors in the various Olympic competitions. The design of the Italian sculptor, Professor Cassioli, Florence, was selected by the International Olympic Committee in 1928 as the permanent Olympic medal, the inscription being changed to correspond to each Olympic Festival. The Organizing Committee was therefore obliged only to provide an adequate number of medals from the mould, which is placed at the disposal of the proper Organizing Committee on the occasion of each Festival. 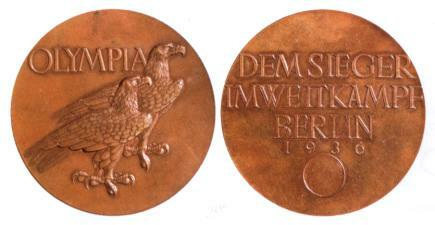 This task was awarded to the firm of B. H. Mayer, Pforzheim, a total of 960 medals being produced. 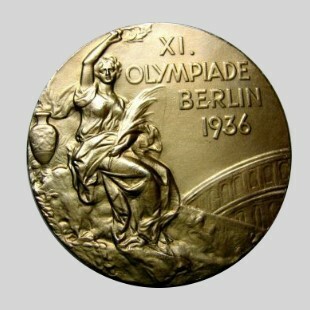 A competition for the design of a winners`s medal for the Berlin 1936 Berlin 1936 Olympiad Games was held, and this medal was chosen. The 2 eagles probably symbolize the German Reich and Olympia. 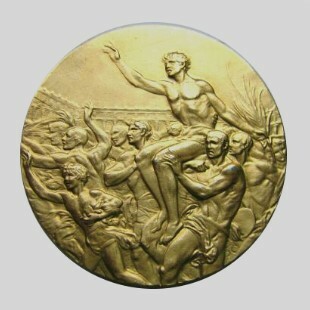 The IOC insisted on the design by Cassioli with the seated Victory.